In 2011, the population of Kuwait was 3.07 million, according to the results of the general population census carried out by the Central Statistical Bureau. Kuwaitis numbered 1.09 million, 36 per cent of the population, compared to the number of expatriates at 1.98 million, or 64 per cent of the population. The census data indicates that the population of the oil-rich state grew by 39.8 per cent between the 2005 and 2011 censuses, with an average annual growth rate of 6.6 per cent, close to the average yearly growth of 6.2 per cent recorded by the World Bank. The growth rate of Kuwaiti citizens was 26.7 per cent, while the growth rate of expatriates was 48.2 per cent, indicating significant changes in the demographic and cultural structure during that period. In 2011, the percentage of males was 49.6 per cent compared to 50.4 per cent for females. It is noteworthy that the number of females increased by 8,049, more than the number of Kuwaiti males. The expatriate population, which constitutes 64 per cent of the total population, mostly comes from non-Arab Asian countries – 1.16 million or 58.6 per cent of the expatriate population. Arab expatriates number about 620,100 (31.4 per cent), 57,300 from non-Arab African countries and the rest from other countries. According to estimates by the Central Statistical Bureau, the population of Kuwait at the end of 2017 was 4.27 million. Of this, the number of Kuwaiti citizens was 1.3 million, while the number of expatriates was 2.92 million. The growth rate was approximately 38 per cent between 2011 and 2017, with an average annual growth rate of 6.3 per cent. This is in line with World Bank figures, which puts the average annual growth rate at 6.24 per cent between 2011 and 2017. The 2017 age structure indicates that 25.02 per cent of Kuwait’s population is under the age of 15 (374,259 males and 345,104 females), according to the CIA’s World Factbook, and 15.1 per cent (238,451 males and 195,700 females) is in the 15-24 age group, while 52.27 per cent (948,902 males and 445,050 females) was 25-54 years old. Only 5.07 per cent (82,366 males and 63,505 females) was aged 55-64, and 2.54 per cent was aged 65 years and over. 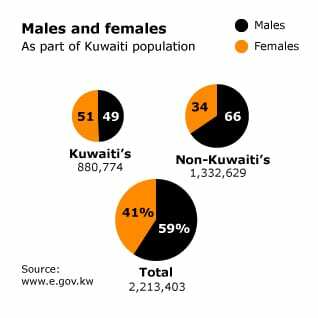 The large disparity in the gender distribution in the 25-54 age group (948,902 males and 445,050 females) is due to a large number of male expatriates coming to Kuwait without their families. According to 2017 estimates, the fertility rate was estimated at 2.4 births per woman, and the life expectancy was 78.2 years (76.8 for males and 79.6 for females). Kuwait is generally an urban country, with a high population density of 237.2 people/km2 in 2017. Kuwait City has the largest population, with about 3 million people in 2018. In a report issued in the summer of 2009, the Kuwait-based AlShall Economic Consultants deplored the lack of detailed, reliable statistics for Kuwait. Criticizing the 2005 census in particular, the authors of the report compared its results with the country’s first-ever national census in 1957, claiming that the latter, from the pre-electronic age, was far more accurate, open, and detailed. In the same report, AlShall warned the nation’s planners that they risked finding that ‘in the end… reality is moving in the opposite direction from what they think’. The present rulers of Kuwait, like their forebears, surely understand the importance of accurate and detailed demographic figures for designing and executing government policy, but in contemporary Kuwait short-term political and security considerations are given priority. The perceived geopolitical threat of the (Shiite) Islamic Republic of Iran for example, has turned all up-to-date information on the Shiite minority into politically ‘sensitive’ data, so no reliable information on the most important sectarian divide among Kuwait’s citizens is made available. The US Department of State estimated that, in 2010, 70 percent of the national population was Sunni and 30 percent Shiite. The growing influence of Islamist political groups in recent decades only adds to the government’s reticence on religion-related statistics, especially those that concern the growing number of non-Muslim migrants from South and South-East Asia. ‘Ethnic’ realities are just as controversial: since the 1990 invasion by Saddam Hussein’s Iraq, Iraqi and presumed pro-Iraqi migrants – Palestinians, Jordanians, and Yemenis – in Kuwait have encountered considerable hostility and even temporary persecution. But the major trends in the demographics of Kuwait are clear. In the 1957 census, of the 206,473 Kuwaiti inhabitants who made the record, 113,622 (55 percent) were considered Kuwaiti ‘citizens’, that is, those Kuwaitis (and their offspring) who had been living in the country since at least 1920. Non-citizen Arabs totalled 62,567, or 30.3 percent of the total population. The largest group among the latter were Iraqis (26,035, or 41.6 percent). In total, 85 percent of Kuwait’s inhabitants were considered ethnically Arab. The largest group of non-Arab foreigners were Iranians: 19,919, or 9.6 percent of the total population. Many Kuwaiti Iranians spoke Arabic as their second or even as their first language. So, in 1957, Kuwaiti society was still quite homogeneous in cultural and linguistic terms. Since 1985 the number of non-citizens resident in the country has not been itemized by nationality or ethnicity. In that year, 78 percent of the population was still designated as ‘Arab’ (40 percent Kuwaiti), and 21 percent of the population was ‘non-Arab Asian’. According to the first article of the 1962 Constitution, Kuwait is an ‘Arab state’, and its people are part of ‘the Arab nation’, and that is currently the official line. 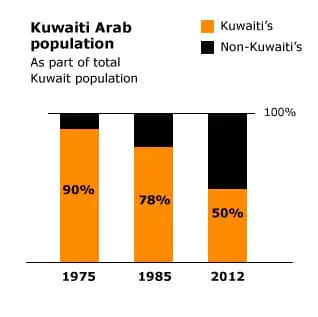 The Arab population of Kuwait, as a percentage of the total population, has declined rapidly since the late 1970s, from almost 90 percent in 1975, to 78 percent in 1985, to an estimated 50 percent at present. The Arabs of Kuwait can be divided along class, tribal, national, sectarian, and family lines. At the top of the hierarchy stands the royal family, the Sabah clan. Since the 18th century the Al Sabah (the Sabah family) have provided the rulers of Kuwait, although before colonial times, Kuwait’s rulers ‘ruled’ merely as first among equals. The more autocratic political reality of present-day Kuwait developed only after Mubarak the Great, who ruled from 1896 until 1915, concluded a pact with the British in 1899. The Al Sabah belong to the majority Sunni sect of Islam. They claim descent from the Bedouin Anizza tribe of central Arabia and so call themselves asil (pure, noble). This traditional Arab designation should be interpreted as a claim to nobility rather than as referring to some sort of ‘ethnic purity’. Many tribal Arabs of Kuwait have African or Baluchi blood, especially the traditionally more well-to-do. This is the result of the old custom of concubinage and slavery in the Middle East, which continued well into the 20th century. Some (lower-ranking) members of the Sabah clan are probably of African descent. When Sheikh Abdullah III al-Salim al-Sabah proscribed slavery in 1952, the freed slaves, following Arab tribal tradition, took the family name of their owners and became associates of their clans. No reliable estimate of the number of African-Arab Kuwaitis is available, because it is such a sensitive subject among modern Kuwaitis. Directly beneath the Al Sabah in social prestige are the other tribes of the Bani Utba, the umbrella name for the various Bedouin tribes that migrated from the Najd region of central Arabia to the Gulf coasts during the 18th century or earlier. Among them are the Bahar, Hamad, and Babtain clans. While the Al Sabah specialized in diplomacy and a rudimentary form of administration, the other Najdi clans of Kuwait specialized in trade and commerce. They controlled the local pearling and fishing industries. Their wealth and social standing used to be comparable to that of the Al Sabah, and intermarriage between the merchant elite of the Bani Utba and the ruling family was common practice until modern times. During the 20th and 21st centuries the ruling family has increasingly taken to endogamy and has, to a certain extent, distanced itself from its former allies. In the first half of the 20th century, the merchant elite formed Kuwait’s civil society. It has traditionally led the drive for political representation in Kuwait. While the Utbi families take pride in their Bedouin descent, they have led a settled life for centuries. Ironically, those Kuwaitis who can more rightfully claim the title ‘Bedouin’ are, in many respects, second-class citizens. 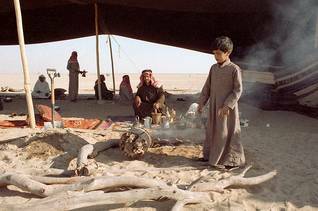 During the 1950s and 1960s Bedouin tribes from the deserts of Saudi Arabia, Iraq, and Syria, attracted by the oil economy, migrated to Kuwait. They were welcomed by a government that preferred conservative, uneducated Bedouin workers to urban Arabs from the Levant and Egypt. In 1981 about 200,000 Bedouin – then about 30 percent of the national population – had been naturalized, but they had no political rights and could not attain high government positions. It was not until after 1996 that most naturalized Bedouins and their children acquired political rights; they still face discrimination in some respects, and their citizenship can be revoked by the Ministry of the Interior, unlike that of ‘original’ Kuwaitis. 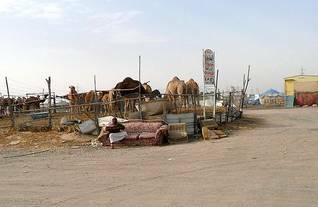 The urbanized ‘Bedouins’ now form the majority of the Sunni Arab citizen population. They traditionally constitute the backbone of Kuwait’s security forces. 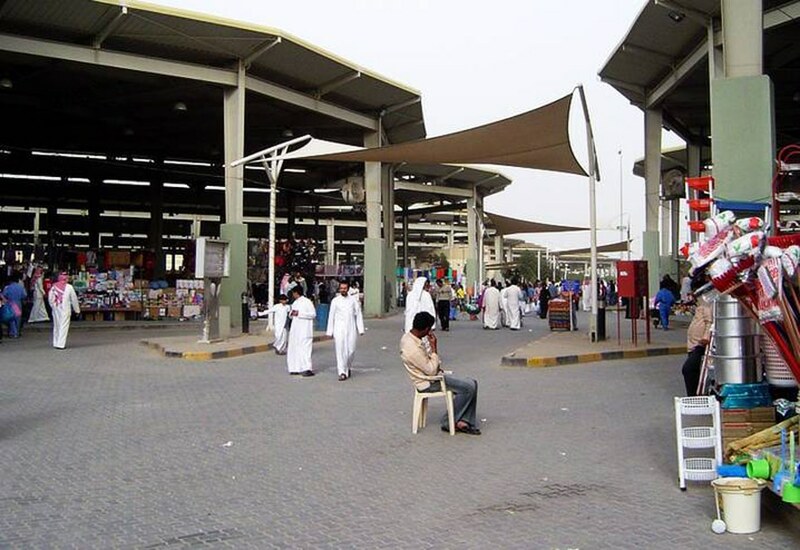 Shiite traders and craftsmen have, for centuries, settled in Kuwait. Their backgrounds have been diverse. Some were Arab migrants from the historical Iqlim al-Bahrayn region, consisting of present-day Bahrain, Qatar, and the Eastern Province of Saudi Arabia. Others were ethnic Persians/Iranians or Arabs from Persia/Iran. Still others came to Kuwait from Syria, Lebanon, or southern Iraq, such as the well-known Iraqi Mutawa family and its Saleh offshoot. The local Shiite community as a whole (often estimated at 25 percent of the citizen population) has always been relatively affluent, compared with that of other Gulf Cooperation Council (GCC) states, notably Bahrain and Saudi Arabia. But the status of the well-to-do local Persian/Iranian merchant families (such as the Bahbahanis, Qabazards, and Dashtis) is not shared by the majority of Kuwait’s Shiites. Having generally lived in poverty in pre-modern times, most Kuwaiti Shiites are today part of the middle classes. They are renowned for their work ethic and educational attainments. Despite official Kuwaiti assertions that sectarian tensions among Kuwaiti nationals are a recent phenomenon and result solely from ‘foreign’ (i.e., Iranian, Syrian, or Iraqi) manipulation, Kuwait’s Shiites have always experienced some discrimination. When the Utbi elite formed the country’s first (short-lived) National Assembly in 1938, the Shiite population was not represented. 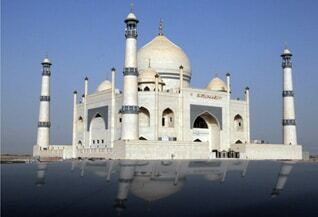 Shiite mosques, unlike Sunni mosques, lack funding by the state in Shiite or other ‘sensitive’ areas. In the 1980s, when Kuwait was rocked by a series of terrorist acts inspired and/or directed by the Iranians, some local Shiites were involved. According to some contemporary commentators, Kuwait risked Lebanese-like sectarian strife. But in the aftermath of the Iraqi occupation of 1990-1991 – during which many Kuwaiti Shiites joined the resistance, along with their Sunni compatriots – sectarian tensions eased. Before 1961, people could travel freely from anywhere in the Gulf region to Kuwait and vice versa, but, since independence, a nationality law has restricted free movement. Some 200,000 members of Bedouin tribes from Kuwait and the region surrounding it succeeded in acquiring ‘second-class’ Kuwaiti nationality. When the government began to grant citizenship to Bedouin after independence, not all applications were approved. The process of naturalization was selective and based, at least partly, on political considerations: the ruling elite aimed to use a limited number of presumably loyal new citizens as a counterweight to the politically more conscious and active ‘original’ citizens. Nevertheless, many Bedouin who belonged to tribes that had traditionally lived in Kuwait or its immediate vicinity, had no papers to prove this and, probably more importantly, did not have the right contacts to further their case. Many ended up with no nationality. Others chose not to apply for citizenship in their home country – often Saudi Arabia, Iraq, Jordan, and Syria – and chose to destroy or hide their original nationality papers because of the opportunities the new state of Kuwait appeared to offer them. When their applications for citizenship were rejected, they too ended up stateless (bidun jinsiya, ‘without nationality’, hence the term bedoun). 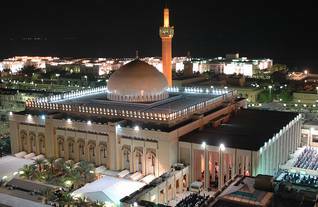 According to most estimates, including government figures, at least 100,000 bedoun presently reside in Kuwait. Their dire legal status is illustrated by the fact that their affairs are handled by the Executive Committee on Illegal Residents of Kuwait’s Interior Ministry. Since the 1980s (when the authorities came increasingly to perceive migrant groups as a security threat) bedoun have experienced serious discrimination by the government in public employment, health services, housing, and travel permits. Their standing in the eyes of Kuwaiti officials, and citizens overall, has suffered particularly from the fact that a few of Kuwaiti bedoun has been involved in acts of violence in the country. And, although some bedoun joined the resistance in 1990-1991, others, many of whom had an Iraqi background, collaborated with the occupation authorities. On 12 July 2007, the National Assembly formed a committee for bedoun affairs to address the pressing issue of stateless inhabitants. The committee has so far taken no specific actions, but it has issued recommendations such as granting driving licenses, improving education and housing conditions, and increasing employment rights for bedoun. For more information, see Human Rights Watch’s 2011 report Prisoners of the Past: Kuwaiti Bidun and the Burden of Statelessness. 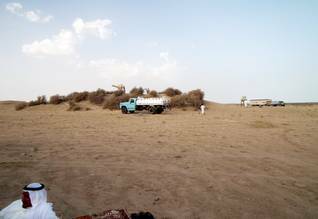 Almost immediately after returning from exile in Saudi Arabia in the spring of 1991, the government announced its intention to reduce significantly the country’s dependence on foreign workers. This announcement was essentially a reiteration of similar statements made during the 1980s, differing primarily in the scale of its ambition. The new policy intention reflected the stated belief of the Minister of the Interior that a fifth column of expatriates, left behind by the Iraqi army, was intent on destabilizing Kuwait. Many citizens believed that non-citizens had collaborated on a large scale with the occupying authorities. Officials spoke of a target population of no more than 1.2 million inhabitants, including a maximum of 200,000 non-citizens. From the summer of 1991 to the spring of 1992, Kuwaitis probably accounted for a slight majority of the country’s inhabitants, for the first time since the early 1960s. This was largely the result of threats and violence against, and the forced deportation of, long-term expatriate residents with Palestinian or Iraqi roots. By mid-1992, however, foreigners were again in the majority. Kuwaitis were clearly not prepared to take jobs typically filled by foreigners, or they were not hired to do so. At present, non-citizens constitute about 50 percent, a significant proportion of the population. The number of foreigners in the country’s labour force is even greater, more than 75 percent, and there is no indication that that fraction will decline significantly in coming years. This also means that society will remain unbalanced in gender terms, as the expatriate population is overwhelmingly male: in December 2007 females constituted just 31 percent of the non-citizen Kuwaiti population (as opposed to 51 percent of the citizen population), bringing the female share of the total population down to 37 percent). This figure, of course, excludes illegal migrants, such as prostitutes, who are officially banned but who are nevertheless tolerated to a certain degree for practical and political purposes. 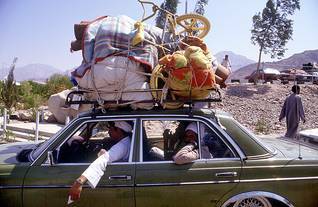 Before the Iraqi occupation, Arabs of various nationalities constituted the largest part of the expatriate population. Palestinians (estimated at 400,000), Egyptians, and Iraqis were the main subgroups on the eve of the invasion. Uneducated Arab migrants worked in the oil industry or agriculture or served in the army and security forces. Educated Arabs, especially Egyptians, worked as doctors and teachers. Although they were culturally akin to the citizen population, the state soon began to perceive the Arab migrants as a political threat. Non-citizen Arabs have generally not been as politically passive as the rest of the expatriate population. Partly because they are culturally akin to Kuwaiti citizens, they have proven receptive to disruptive political currents in the region, such as pan-Arabism (in the 1950s and 1960s) and political Islam (‘Islamism’) since the late 1970s. After liberation in February 1991, the country was largely purged of Arab migrants from Iraq and other Arabs perceived to be pro-Iraqi: Palestinians, Jordanians, and Yemenis. Of the large pre-war Palestinian population, only about 30,000 remained in the country. At present, non-Arab Asians form the largest group of non-nationals in Kuwait. Within this diverse group, Indians and Pakistanis are traditionally most numerous. While the state prefers South and East Asians for security reasons, the private sector favours them for their general acceptance of low wages, long working hours, and hazardous working conditions. Male Asian migrants work mainly in the construction and service sectors, females as nannies or domestic workers. They typically stand on the lowest rungs of the nation’s status and income ladder. In 2010 the Kuwaiti National Assembly passed the country’s first minimum-wage law, applicable to non-nationals as well as Kuwaitis. The wage of 60 KD (Kuwaiti dinars) per month (about USD 210) is, however, significantly below the average Kuwaiti salary of about 1,000 KD per month. Since the rise of the oil economy in Kuwait, Westerners have filled many of the well-paid local jobs in higher management, engineering, and consultancy. As a group they have never constituted more than a few percent of the foreign workforce. Still, due to the specialized type of work they are hired for – which generally requires higher vocational education and comes with attractive salaries and additional material advantages – they are at the top of the expatriate social ladder. They tend to be uninterested in or uninformed about local politics and social issues, which greatly enhances their appeal for the state. They live and socialize largely amongst themselves, a practice actively encouraged by the government, which wants to avoid any type of friction between the perceived ‘liberal’ Westerners and the generally morally conservative citizen population. Most Western expatriates in Kuwait used to be British, but since 1991, when Kuwait and the United States intensified their military and commercial relationship, Americans have dominated the local Western expatriate scene. Since 2002, with a peak in 2005, Americans in Kuwait have been the target of local citizen and non-citizen Sunni extremist groups. The issue of Westerners’ safety in Kuwait is intimately linked with the political situation in neighbouring Iraq and Saudi Arabia and that of the Muslim world at large. o threaten public security, the public interest, or morals. Because Kuwait’s immigration regulations prohibit residence without a work contract, and refugees are only rarely allowed to work in Kuwait, the Office of the United Nations High Commissioner for Refugees (UNHCR) submits the cases for resettlement of refugees to countries other than Kuwait. Like all Gulf Cooperation Council member states, Kuwait has not signed the 1951 UN Convention – or the 1967 Protocol – on the Status of Refugees. Kuwait’s laws do not provide for the granting of asylum or refugee status, and the government has established no alternative legal system for providing these groups with protection. The government does co-operate with the UNHCR to allow for some protection of refugees and asylum seekers. It claims not to deport asylum seekers to countries where the latter fear persecution, but it does not allow verification of this claim. The authorities are said to detain asylum seekers until they agree to return to their country or make other travel plans. 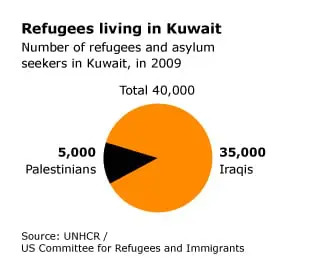 International refugee organizations estimated the total number of refugees and asylum seekers in Kuwait at 40,000 (35,000 Iraqis and 5,000 Palestinians) in January 2009. To the casual visitor, all native Kuwaitis may appear extravagantly rich, and ‘native’ social life in Kuwait thus seems a highly egalitarian affair, but this is far from the case. Kuwaiti society has always been characterized by pronounced class differences, and in present-day Kuwait, class awareness has not diminished appreciably. The ruling Al Sabah and the traditional urban merchant families such as the Al Saqr, Al Ghanim, Al Bahar, and Al Qatami, have always been, and remain today, in the highest social class. This indigenous aristocracy has, surprisingly, survived the sweeping social changes that accompanied Kuwait’s transformation from a poor trading entrepôt into a benevolent, oil-based welfare state. Although some entrepreneurs from the middle classes have, in recent decades, managed to accumulate considerable wealth, they have not acquired the particular aura of social prestige that surrounds the old Kuwaiti merchant families. 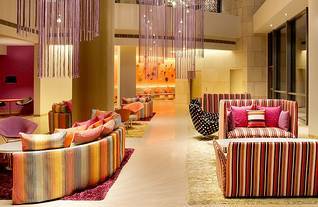 The former must therefore be considered a separate, lower social class of nouveau riche in Kuwaiti society. The old Kuwaiti aristocracy, which has strengthened its tradition of intermarriage after independence, still restricts the public’s access to almost all lucrative contracts, contacts, and positions. The average Kuwaiti invests at least as much of his time and other resources in the crucial creation of a powerful personal network, called wasta, as in the building up of his/her personal specialist knowledge and expertise.